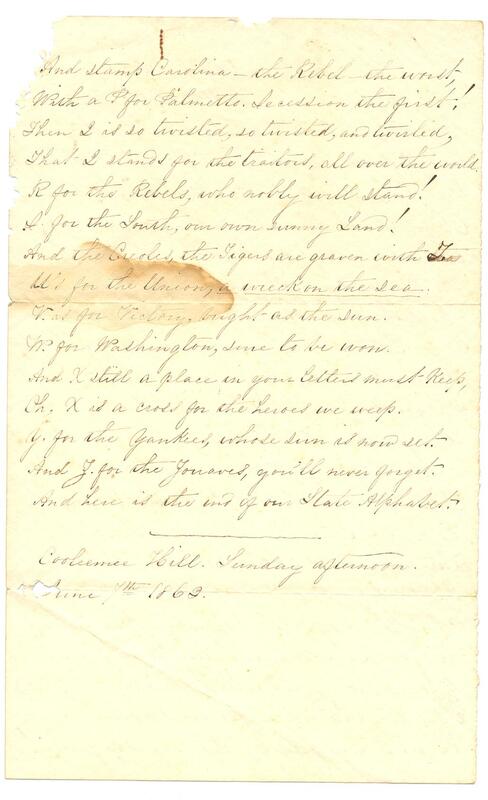 Item Description: Poem, dated 7 June 1863, from the John S. Henderson Papers. The unidentified author assigns a trait or subject relating to the Confederacy to each letter of the alphabet. Item citation: From folder 34 of the John S. Henderson Papers, the Southern Historical Collection, Wilson Library, University of North Carolina at Chapel Hill. For Beauregard, Barton, Bethel, and Bee. Our bold little ship, all afloat on the wave! Shall the fame of our glorious President be! F is for Freedom, the freedom of right. G is for Georgia, the flower, the Queen! H is for Hampton – his Legion, I mean. I is for Infantry, sturdy, and strong. J to the Johnsons, and Jacksons belong. The monarch of nations, in glory alone. M’s for Manasses – our glory – our pride! N for our navy, the waters to ride. O for the Oglethorpe’s – glorious name! Oh, write it in gold on the pages of fame! With a P for Palmetto. Secession the first! That Q stands for the traitors, all over the world. R for the Rebels, who nobly will stand! S for the South, our own sunny Land! And the Creoles, the Tigers are graven with T.
U’s for the Union, a wreck on the sea. V is for Victory, bright as the sun. W for Washington, sure to be won. Oh, X is a cross for the heroes we weep. Y for the Yankees, whose sun is now set. And Z for the Zouaves, you’ll never forget. And here is the end of our State Alphabet. 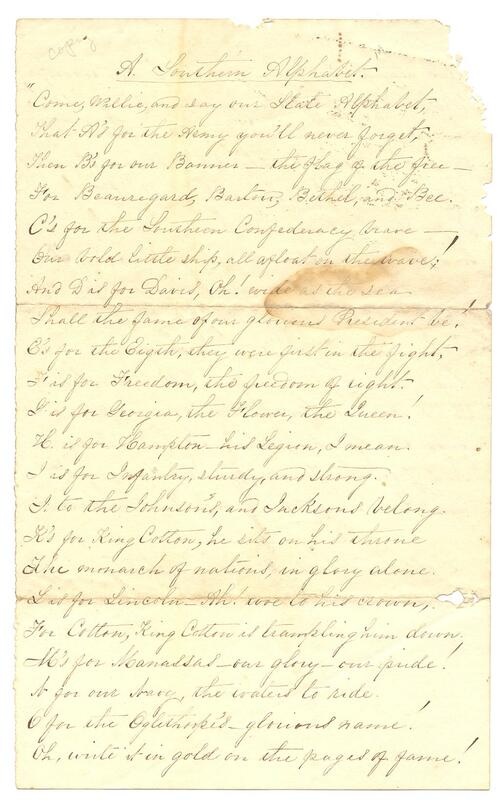 This entry was posted in Southern Historical Collection and tagged Cooleemee Hill, John S. Henderson, John Steele Henderson, poetry. Bookmark the permalink.